At one time this Arbeiter (worker) version of Cordon Bleu was the only way for lower classes, who could not afford more expensive meats like veal, to make this perennial favourite. 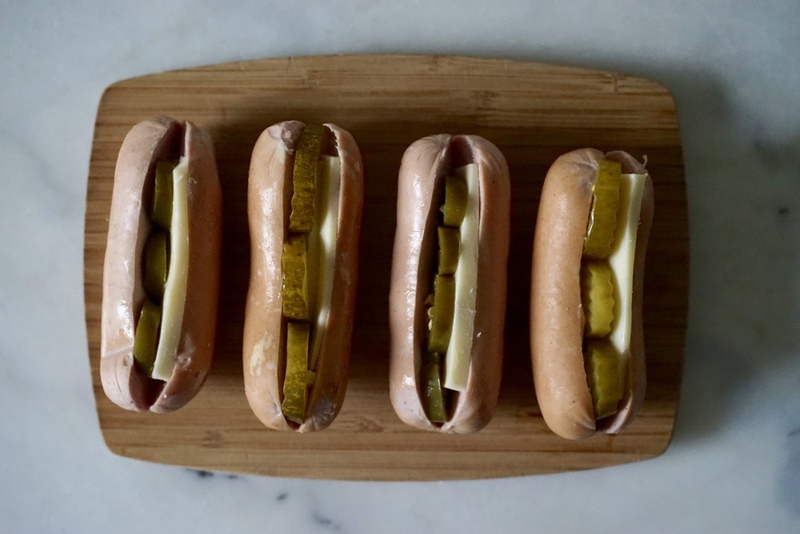 Today it is a favourite for anyone who loves sausages and melted cheese (yes, please). Typically, this dish is made out of Switzerland's beloved cervelat, a sausage made of beef, pork and pork rind, bacon and seasonings, then stuffed into oxen intestines (with ice, to help binding), smoked, and boiled. According to the Kulinarisches Erbe, the name probably comes from the Latin cerebellum (which later becomes cervelle in French or cervello in Italian), because historically it contained pork brains. Stuff that with cheese, wrap it in bacon, and you've got dinner. More about the cervelat here. This version is based on the Betty Bossi recipe found here. Pictures on this post were taken by Sam. Preheat the oven to 220 C / 425 F / gas mark 7. Peel the cervelat and make a deep, length-wise incision. It's easier if you don't cut them completely in half (but if you do cut too deeply and they fall apart, no problem, the bacon will hold them together). Spread with mustard, then stuff with cheese and pickles or jalapeños. 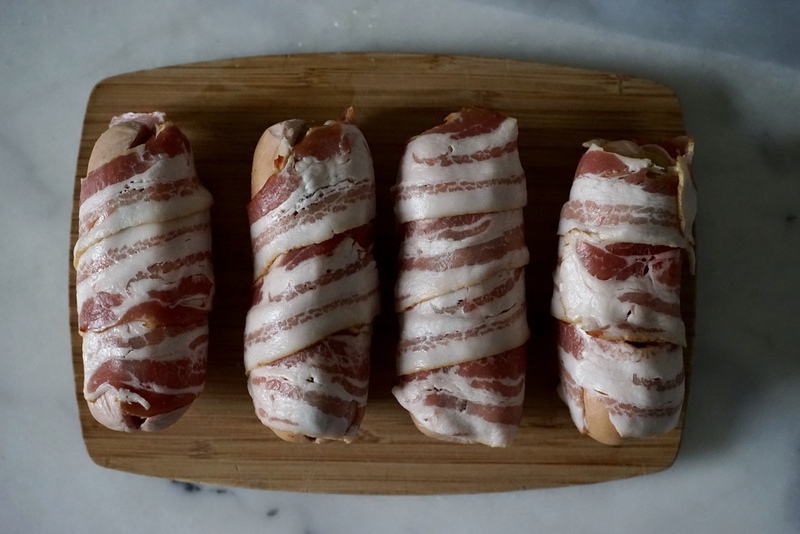 Wrap the sausages in bacon, about three rashers per sausage (though this will depend on the size of your sausage and the width of your bacon). Lay on a foil or parchment covered baking sheet and bake for about 15 minutes, turning them over once, until the bacon is nice and crispy. I haven't tried this with other kinds of sausages, but I suspect it would work just as well. You could do this on the BBQ as well, though probably using foil or some sort of grill pan. Here I used pickles and jalapeños, but you could also stuff these with olives, sun-dried tomatoes, ham, etc. or just have it plain, with cheese.